Abortion access in Missouri is getting easier, thanks to Planned Parenthood and Satanists. 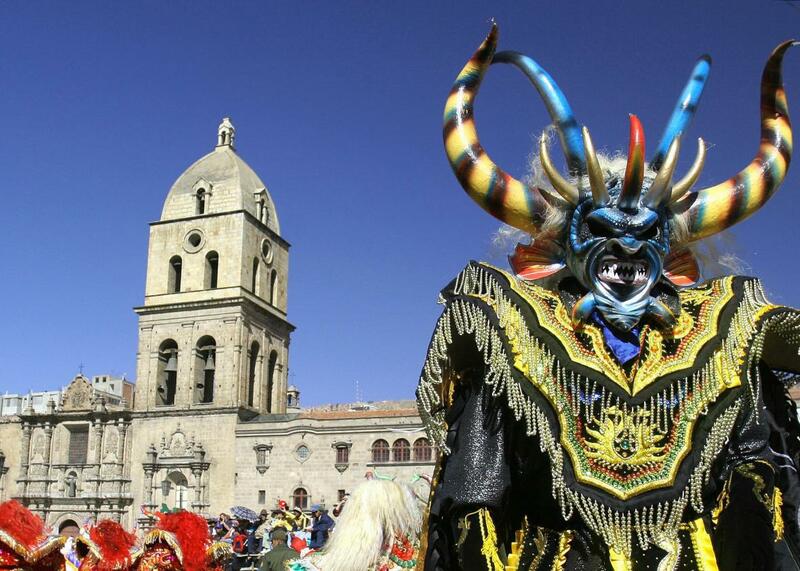 Lucifer celebrates life in La Paz, Bolivia. Here’s a sentence I never thought I’d write: Abortion access in Missouri is booming. Until this month, the state had only one abortion provider—a Planned Parenthood health center in St. Louis. On Monday, the organization announced that its clinic in Kansas City is now offering medication abortion. Its Columbia outpost will soon offer surgical abortions, too, and two others will likely follow. For the past several years, Planned Parenthood and other women’s health clinics in Missouri have been targeted by restrictions that forced abortion providers to get admitting privileges at nearby hospitals and retrofit their facilities to meet surgical center standards. Those laws eventually became common goals of anti-abortion legislators around the country, but Missouri was ahead of the curve: In 1986, it was the first state to enact mandatory hospital admitting privileges. After the Supreme Court’s historic ruling that overturned similar restrictions in Texas, Planned Parenthood and two other reproductive rights groups took Missouri to federal court, arguing that it had four clinics in the state that could provide abortions—in addition to existing contraceptive care and health services—if the regulations were lifted. A federal judge sided with Planned Parenthood in April and blocked officials from continuing to enforce the two anti-abortion provisions in Missouri. Now four clinics are working to get licensed for abortion care in the state: In addition to the Kansas City location, which stopped offering abortions five years ago, and the Columbia one—which stopped in the fall of 2015 when University of Missouri administrators voted to revoke its hospital admitting privileges—Planned Parenthood intends to offer abortion care at its Joplin and Springfield centers after their state inspections. This rapid turnaround makes the state an illustration of the best-case scenario when courts reverse abortion restrictions. Other states aren’t so lucky. Often, such restrictions cause abortion providers to close completely, especially if the clinics aren’t affiliated with larger national organizations such as Planned Parenthood, which can provide some measure of stability as regulations shift. And when a clinic shuts down, there’s no guarantee that it’ll reopen once the restrictions that caused its closure fall away. A year after the Supreme Court’s Whole Woman’s Health v. Hellerstedt decision, only two of the nearly two-dozen abortion providers that shuttered due to the two provisions axed by the court had resumed abortion services. Missouri argues that just because the laws align with the tenets of certain religions doesn’t mean the state is advocating on behalf of those religions. But don’t tell that to the Missouri state legislator who slaughtered a chicken on camera in June to make some kind of statement against legal abortion. “God gave us man dominion over life. He allows us to raise animals properly and care for them and then process them for food so we can sustain life. And that’s what I’m doing here with this chicken,” Rep. Mike Moon said before ripping out the animal’s heart. Three cheers for Missouri, the upside-down land where Christians perform the gruesome animal sacrifices and Satanists bring the religious freedom lawsuits.